Artist verses Hobby blacksmith: What are your thoughts and what gives you inspiration? - The Iron Forge Fire Blackmithing Forum. I thought this an interesting topic. I see many things and want to make them or I deconstruct them in my head. Still I'm and the basic level in many ways. I was recently challenged to make a railroad spike bottle opener. That wasn't interesting to me though. So I upped the ante. 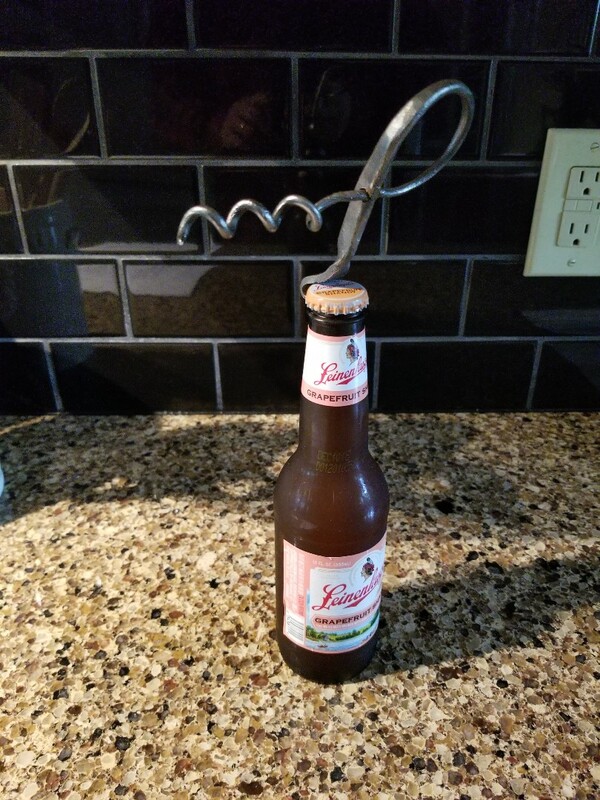 How about a corkscrew and bottle opener instead from this piece of rod? I Said. Away I went 45 minutes later with I forged my project. Now back to the question. What gives you inspiration? The corkscrew was something I saw on the interweb somewhere. I added my own twist. Here this was a challenge and a visual image of something I had seen before. The project raised a question for me. So I really started a study of what inspired me. Of all the things I could list, The simplest answer is the work created from the master smiths. Regardless of their discipline it was work done by those who are competent at the craft. The push to do something creative usually starts from seeing something others have done and the thought "I can do that" or "I can do better". Once you get good at that, it becomes "How about I do this or that" ... and then "This will sell well"
I prefer to call those thought motivation rather than inspiration. I get my motivation from usually practical needs, like a rail for a deck or a balcony and then it evolves from there ... how about I make it adding this or that decorative twist. As a Novice Hobbyist, I see something I like and then change it to fit my thoughts. At this time I do not try to do things I have no idea about, Knives for instance, As Jim stated, he works as an Artist, me... I am no artist, if you have to label me other than Hobbyist, I would think Modified Copier might work. I just recently made a Desk Lamp out of 1/2" Pipe, I looked on line, took all the features I like the most from what I saw and that fit what I needed, and made the Lamp, that is exactly what I WILL do until I can be more creative. Creativity is a relative term. No one is completely original, for the simple reason that our thoughts are the product of an array of information, experiences and values that the brain uses to produce an outcome. Even the most creative artist or inventor is using everyone else's creations to make his own. So I would say that originality is overrated. Fashion is but copying each other in an original way, and even the most famous painters and writers quote who "inspired" them, meaning who they liked and copied / followed / emulated / or other big words to the same effect. Lately I have been "inspired" (the word sounds ridiculous to me in this context) by some Ukrainian blacksmiths who make some interesting stuff for public display.